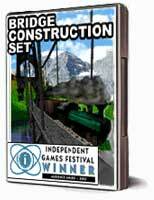 Give Bridge Construction Set as a gift for download! Immediately after ordering BCS you will be sent a keycode and download instructions. Read more! Multi platform support: Bridge Construction Set supports Windows, Mac OS X and Linux: Buy once, and you can download and run the game on any of these systems! Over a hundred unique levels.